Our boat launch was very successful. We managed to fit three people in our boat without it sinking. We had some suspicion near the end that it might not work, but it proved to be very sturdy and stayed afloat for quite a while until it was “accidentally” tipped near the end. We are very proud of the results. We worked diligently, taping every single day and it proved to be more than worth the wait and the work. After completing this project, we are eager to start our next one! We have a couple ideas. Our most popular proposal, as of the current moment, is to attempt to create a musical stairs system. Each stair will represent a different key and will in turn produce the sound that corresponds to that key. We are planning on creating this within our school. Statistics of past versions of this project have shown that when the stairs appear to look like a keyboard, 66% of people will choose them over an escalator or elevator. Although, we don’t have either one of these in our school, by making the stairs more fun to walk on, more people will want to take them, therefore making a healthier society for everyone. So let’s decrease obesity! Haha. Another project idea that is a possibility for next semester is a nail/dart sniper. It looks like a lot of fun and a little dangerous and as you know, Whitni, Cody and I live on the edge. 🙂 There is also a water bottle rocket project that looks like it could be decently simple and interesting. We will keep you posted as to what our decision is. It all depends on availability, I suppose. So, we’ll see. 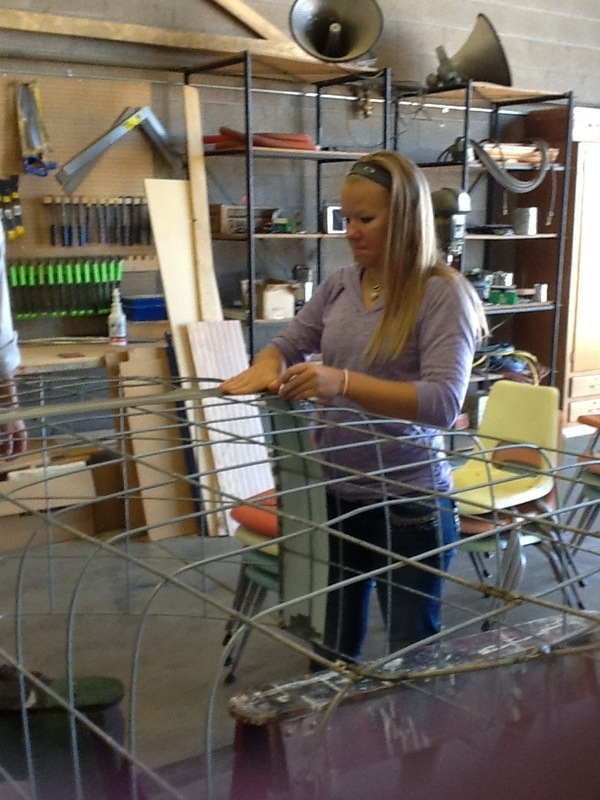 This week we began duck taping our boat frame, which looks very sturdy, actually. The taping process has turned out to be an awfully time consuming step in the completion of this project. All week we used every physics class period to tape. The first day was rather sloppy looking, but as we moved along the side of the boat we increased in speed and created an overall, better appearance. 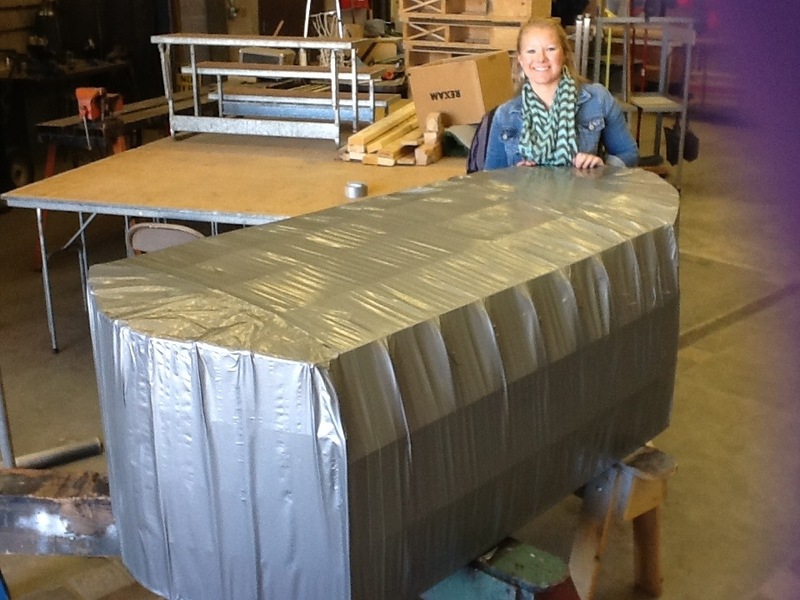 As of yesterday, about three minutes after the end of class, we finished the first layer of tape around our entire boat. Our boat is fairly large, so this we was quite productive in terms of just how much we accomplished. 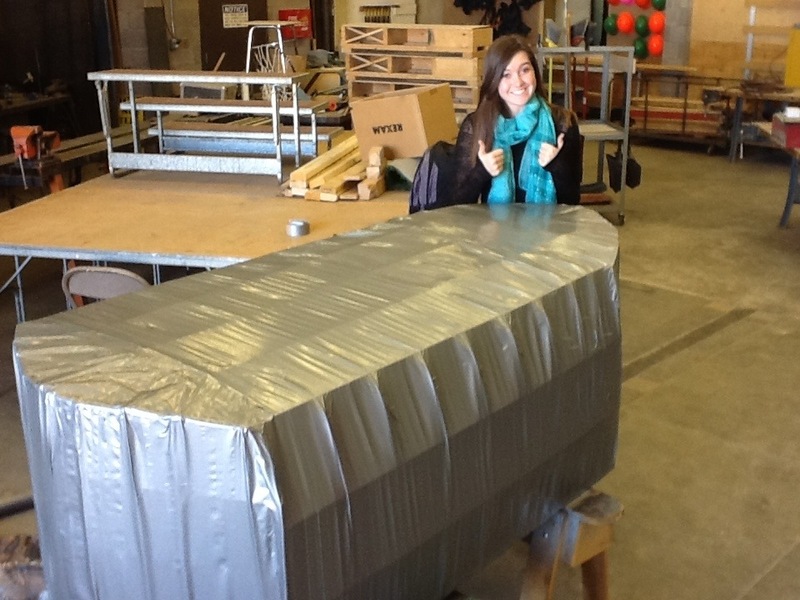 Next week, we plan on adding two more layers of tape to ensure our security and the stability of the boat. We also plan on adding the word ‘Titanic’ to side of the boat in the light blue duck tape we purchased. This may prove a very ironic name if the boat does end up sinking. Hopefully, this doesn’t happen. Anyways, we’ve made a lot of progress in the last few weeks. 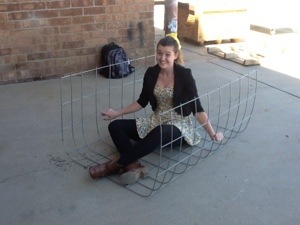 Our project can actually be identified as a boat now, instead of a few random pieces of cattle panel. Although this part of the project is going to take longer than expected, we are very close to being able to sail our boat. We are excited to finally reach the end of this project and see if our hard work does in fact, pay off. Or not. If not, we will be prepared to start a new project with optimism and move forward from this horrible failure. Honestly, I think we are all praying that doesn’t happen. 🙂 By the way, Physics is a lot of fun and we are extremely happy that we chose to take this class! Here are a few pictures of our progress this week. 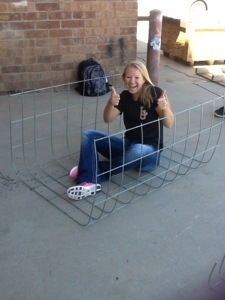 A Weekly Update on the Coolest Project of 5th Hour Physics. Information you might want to know. Team Abby and Whitni do not need a team nickname because they are already so cool just being themselves. This week we took, what we consider to be, a huge step forward. The base of our boat is finally coming together!.. (Thanks to Cody 🙂 ) On Monday, we went to Big R and bought a huge sheet of cattle panel. Although it was a lot more than we actually needed, we figured that if we screw up our first attempt we can use the remaining piece of panel to try again. Mike, Whitni’s dad, had to come and help us move the panel back to the high school, considering it was much too big to fit in, or on top of, Cody’s car. Once we moved the panel down to the shop area, class was over. But at least we had our materials! Tuesday was the day when we figured out the dimensions for our boat base. We decided the best width for the bottom of the boat was four metal intersections across and each side was three metal intersections high so that we can see out of the side but will still prevent water from pouring over the sides. Wednesday, we were both absent. 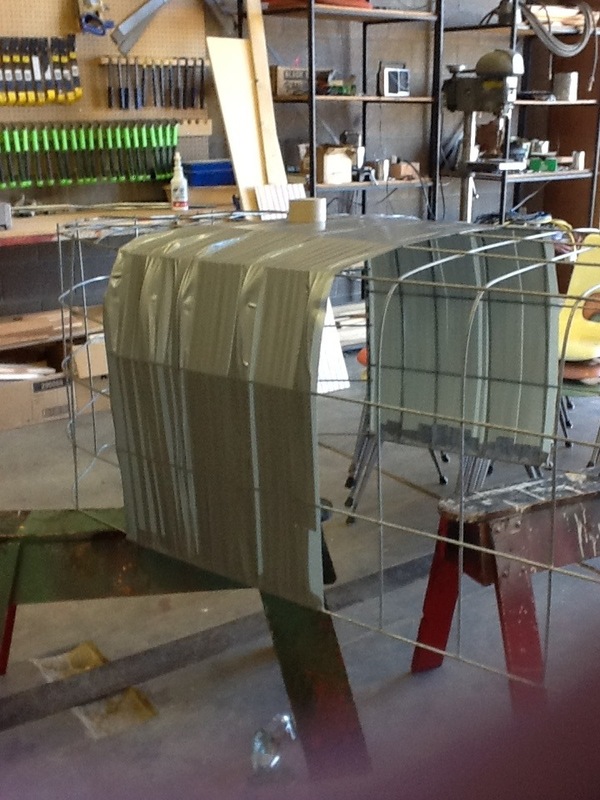 😦 Thursday, Mr. Grimsley wasn’t present at school so we were not able to weld, but on Monday we plan on welding the front and back of the boat together so that we can begin taping and floating as soon as possible.